Marian Goodman Gallery is very pleased to announce an exhibition of new pictures by the German artist Thomas Struth. The exhibition will open on Tuesday, April 30th and will continue through June 15th. Gallery hours are Monday through Saturday, 10 am to 6 pm. 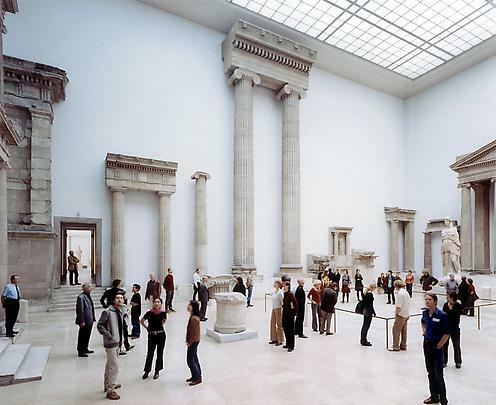 Since 1989, Thomas Struth's museum pictures have depicted architectural monuments and museum interiors – rooms of history -- in relation to their audience, in which the subjects themselves become the portrait. In his newest body of work, Pergamon I-VI, Struth continues his timeless portraits of human identity in relation to the past and to their places of representation. This will be the first time he has exhibited a series of pictures devoted to a single location. 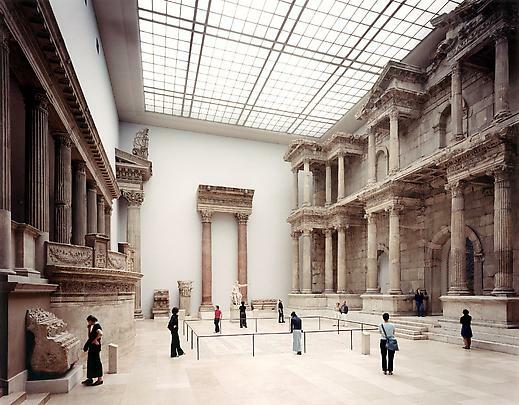 On view in the North Gallery will be five large-scale photographs taken in the Pergamon Museum, Berlin. 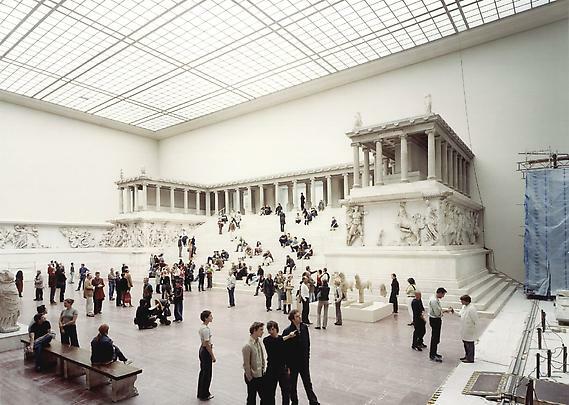 The museum was built to house the reconstructed Pergamon Altar (2nd century BC), excavated in the late 19th century by the German archaeologist/engineer Carl Humann. 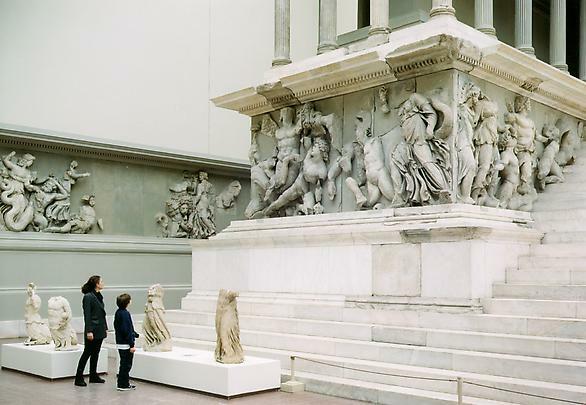 Situated in the former East Berlin, during the post war years the Pergamon's collection was not easily accessible to most Americans and Western Europeans. It was only after the collapse of the Berlin Wall, as the artist says, that "this outstanding example of ritual architecture, constructed mythology and reconstructed history became again visible and tangible for debate." Since the late seventies, Thomas Struth has been known for his architectural and urban photographs, portraits, landscapes, and museum interiors. Trained first in painting, he took up photography in 1974 while a student at the Dusseldorf Academy of Fine Arts under Gerhard Richter (1974), and later, Bernd and Hilla Becher (1976). First photographing people in the streets of Dusseldorf, and other cities, from 1974 to 1977, he later drew on this experience in an early body of work, the black & white street and city scapes, which began in 1977. Early portraits of friends, which began in 1983, launched a series of psychologically oriented family portraits in 1986. Struth's work is characterized by an oblique vantage point and a clarity and neutrality which permits the universal subject to speak. In the past decade he has worked in a variety of genres: portraits of nature--landscapes and flowers commissioned for the Winterthur hospital in Winterthur, Switzerland ( 1992); culture-scapes -- the China pictures (1995-99); museum pictures (1989-2002); and vast landscapes -- including the Paradise pictures (1998-2001)—dense virgin forests in Brazil, Japan, China, Australia, and Germany; and more recently, landscapes of the American West. In May his first major U.S. retrospective will open at the Dallas Museum of Art which will be the most comprehensive exhibition of his work to date, including work from the past twenty five years. The exhibition will be on view from May 12 to August 18th, and will travel to the Museum of Contemporary Art, Los Angeles (in September 2002); the Metropolitan Museum of Art (in February 2003); and the Museum of Contemporary Art, Chicago (in June 2003). Born in Geldern, Germany in 1954, Struth lives in Dusseldorf, Germany, and works in situ. He attended the Academy of Fine Arts, Dusseldorf from 1973-1980. In 1978 he was an artist in residence at PS-1 Studios, Long Island City. From 1993 to 1996 he was the first Professor of Photography at the newly founded Staatliche Hochschule für Gestaltung, Karlsruhe. He was awarded the Spectrum International Prize for Photography, Stiftung Niedersachsen, Germany in 1997-98. 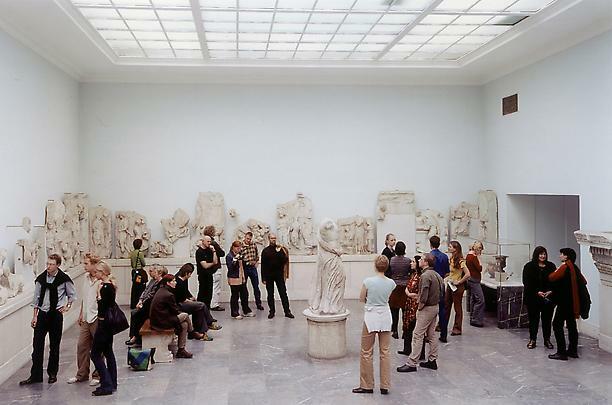 Thomas Struth's work has been exhibited widely in Europe and the United States at such institutions as the Sprengel Museum, Hannover; Carré d'Art, Nîmes; Kunstmuseum, Bonn; Art Gallery of Ontario, Toronto; The Institute of Contemporary Art, London; Museum Haus Lange, Krefeld; the Hirshhorn Museum and Sculpture Garden, Washington; the Renaissance Society, Chicago; the Stedelijk Museum, Amsterdam; and Portikus, Frankfurt. His work has also been exhibited at Documenta IX, Kassel; the Carnegie International, Pittsburgh, and the Skulptur Projecte Münster 87, Münster. In 2000-2001, a retrospective of his work, Thomas Struth: My Portrait, was shown at the National Museum of Modern Art, Tokyo, and the National Museum of Art, Kyoto, Japan.